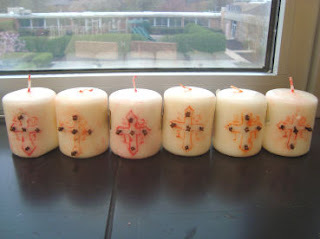 Making an Easter candle (also known as a Paschal Candle) to use at home can be a great religious Easter tradition for your family! The ones we made were made were super easy to do, and I used candles from the Dollar Tree, so this project seriously only cost us $1. These are so much easier to make than it first appears! Scratch your design onto the candle with a dull pencil. Let you kids paint on it however they see fit. Wipe the candle with a baby wipe. Easter candles can have all kinds of symbols. It seems they mostly commonly have a cross with the year written around it. We also have a Paschal lamb on the back of ours. Some other things you could try would be an alpha and omega, wheat and grapes… all kinds of stuff really! Also, poke some holes in each end of the cross and one in the middle to insert cloves. I actually had real cloves this year, but last year I didn’t so we just stuck in some grains of brown rice. 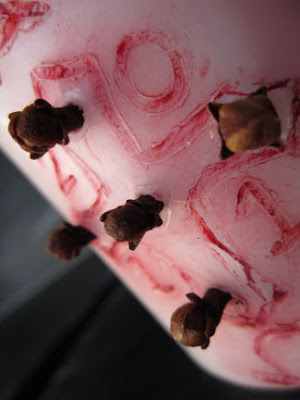 The cloves are inserted like nails, and there are 5 of them to represent the 5 wounds of Christ. I actually love the color variation this painting technique creates! I was trying to come up with a religious Easter craft to use with my preschool class, and thought that making Paschal candles would be perfect! It went even better than I thought it would! 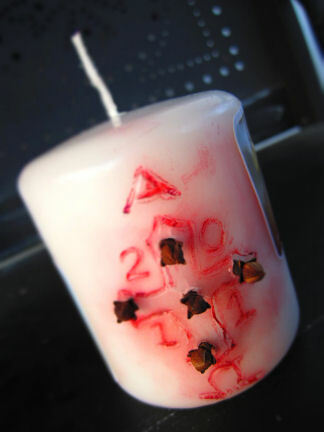 I scratched the design into their candles ahead of time, poked the holes for the cloves, and they took it from there. 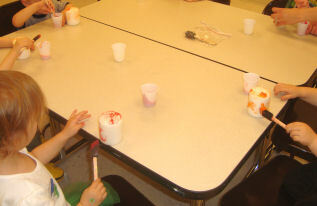 (We used washable tempera paints). are only 2 years old! Don’t Miss a Chance to Teach your Kids! This seems so easy and inexpensive! This is a grate one for all the kids! The little ones can do something basic, while the older ones can get more intricate with their designs. Thank you for sharing! Can I just tell you how much I love your inexpensive little crafts? They are the perfect antidote to so many blogs that I read (and love) that have high dollar ideas that I just can't afford. Thank you so much! I just love the simplicity of this project. And that my little ones can do it too. Thanks! This is fantastic! Thank you so much for a simple craft that will work for all my children (ages 2-10). Thanks Lacy for another easy craft! 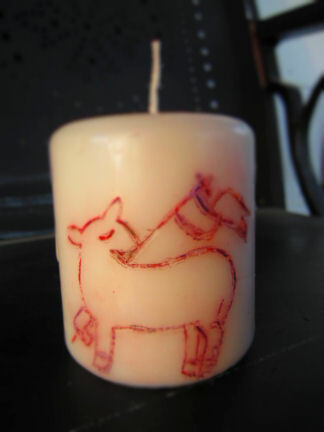 I had bought beeswax at the craft store to make a paschal candle but it is too hard to paint the design onto it. This seems so much easier! We also light our candle when celebrating a family member's Saint's Feast Day. 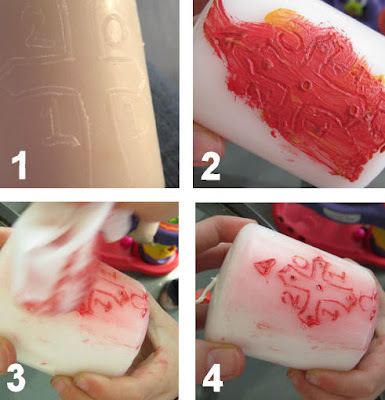 Mary L.
This is a nice simple idea for the younger crowd to be able to make a Pascal candle. Will have to keep that in mind for an activity for the little ones when we do our group activity to paint larger ones with the older ones. Is there a certain paint you use? I was wondering if certain paints might be flammable so if the candle gets to low if it could catch on fire? Or maybe the flame is too far away from the paint? How do you poke the holes in it to get the cloves to stay? Last year, I tried using a paper clip (unbent it first) and then heated it up a bit to get it to poke the wax, but the cloves kept falling out until I glued them in place with superglue! Any tips to make it easier? 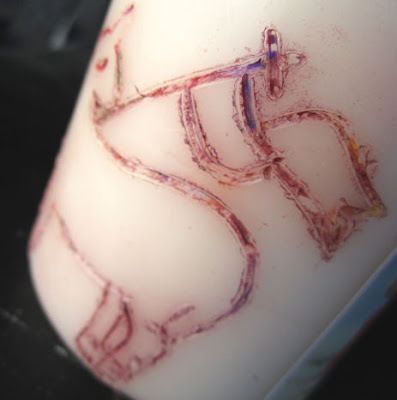 Love the idea of painting over the etched design and then wiping it off… the effect looks very nice! Thank you for the great craft! 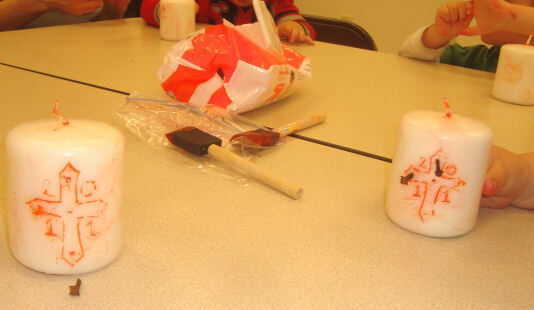 Did these with our playgroup this week (6yr and under) and had a blast. So easy to adapt to other holidays/celebrations too. Hi! Had to write to thank you for sharing your wonderful, creative ideas! I’ve been a catechist for 20+ years, and it’s so nice to stimble on NEW projects/crafts — helps keep me fresh and my own enthusiasm high!! Thanks for the idea, made this yesterday and my son loved it. Then this morning I found this, http://www.focus.org/blog/posts/an-illustrated-guide-to-the-paschal-candle.html , which fits in so nicely!